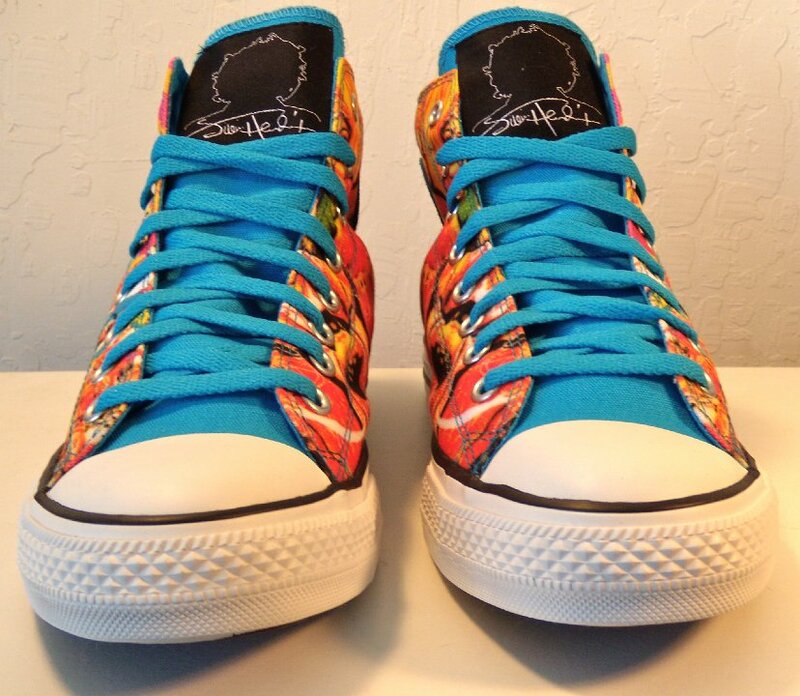 Photo gallery of Jimi Hendrix tribute high top chucks. 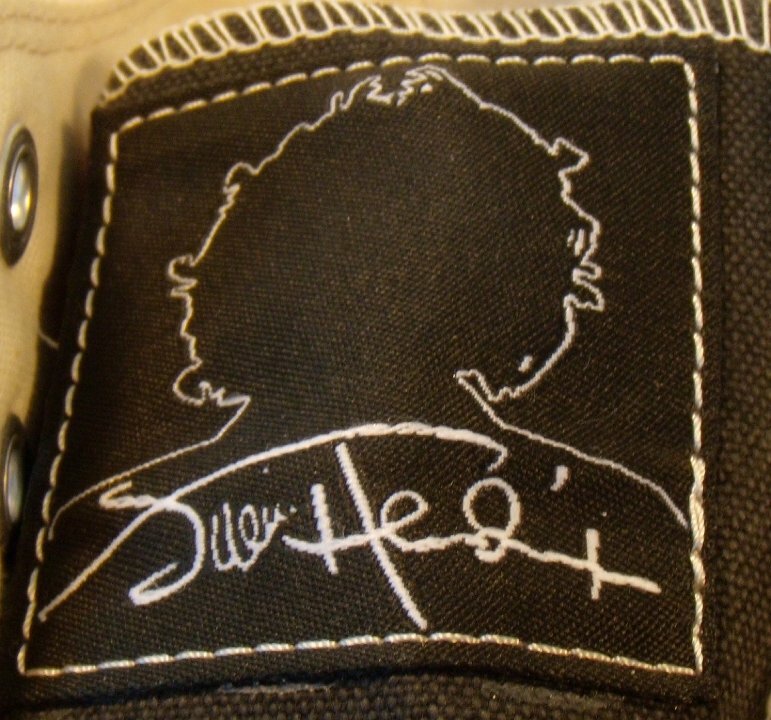 1 Jimi Hendrix High Top Chucks Inside patch view of a right Jimi Hendirx Jacket high top. 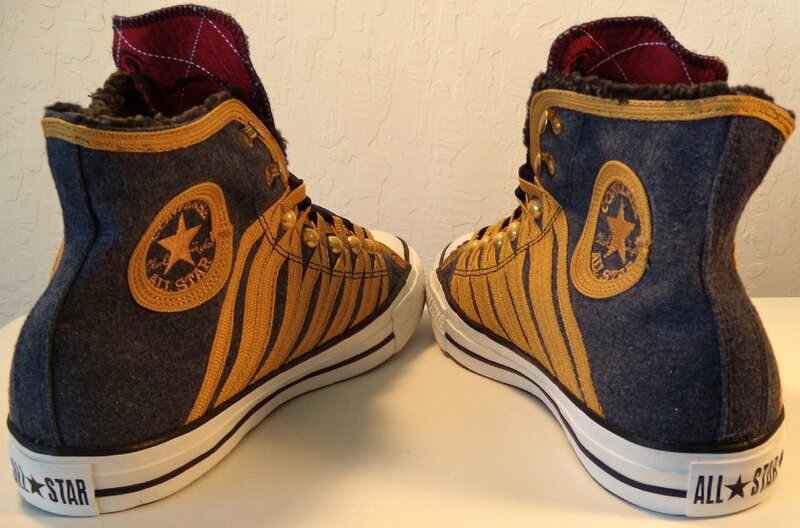 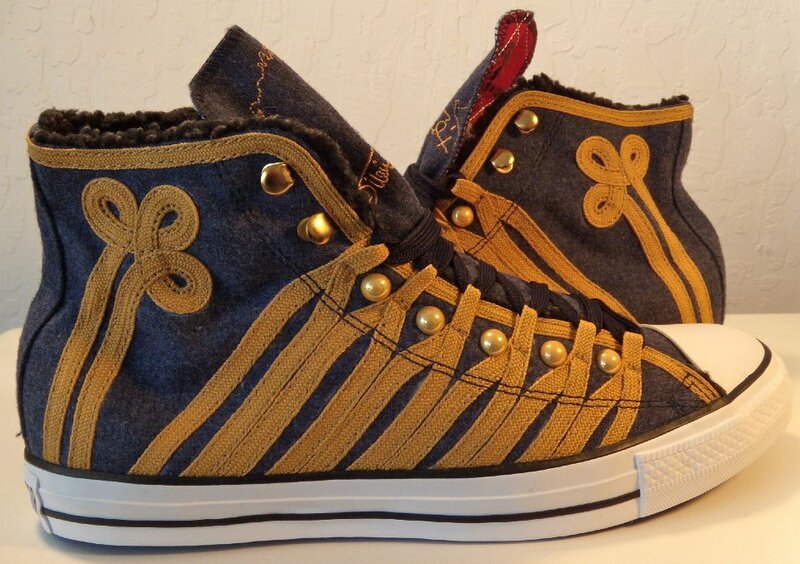 2 Jimi Hendrix High Top Chucks Outside view of a right Jimi Hendirx Jacket high top. 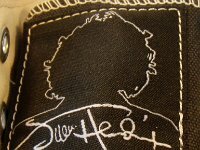 3 Jimi Hendrix High Top Chucks Inside patch view of a left Jimi Hendirx Jacket high top. 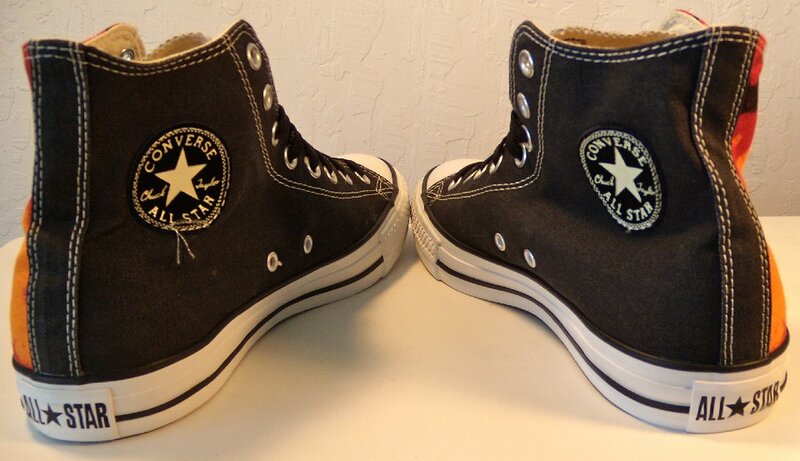 4 Jimi Hendrix High Top Chucks Outside view of a left Jimi Hendirx Jacket high top. 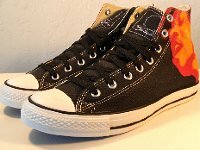 5 Jimi Hendrix High Top Chucks Rear view of Jimi Hendirx Jacket high tops. 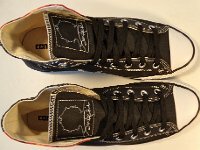 6 Jimi Hendrix High Top Chucks Angled rear view of Jimi Hendirx Jacket high tops. 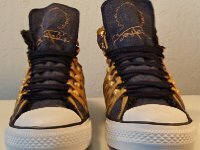 7 Jimi Hendrix High Top Chucks Angled side view of Jimi Hendirx Jacket high tops. 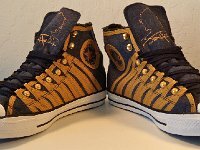 8 Jimi Hendrix High Top Chucks Front view of Jimi Hendirx Jacket high tops. 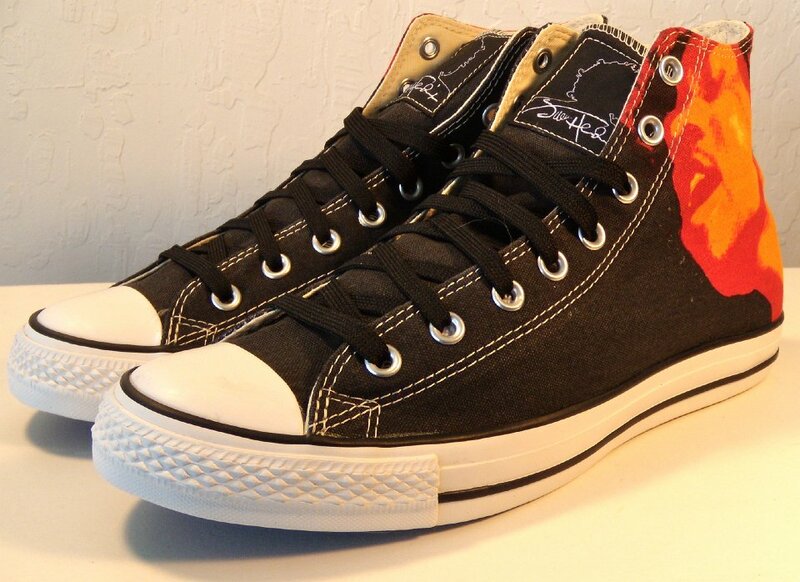 9 Jimi Hendrix High Top Chucks Closeup view of the embroidered tongue on a Jimi Hendirx Jacket high top. 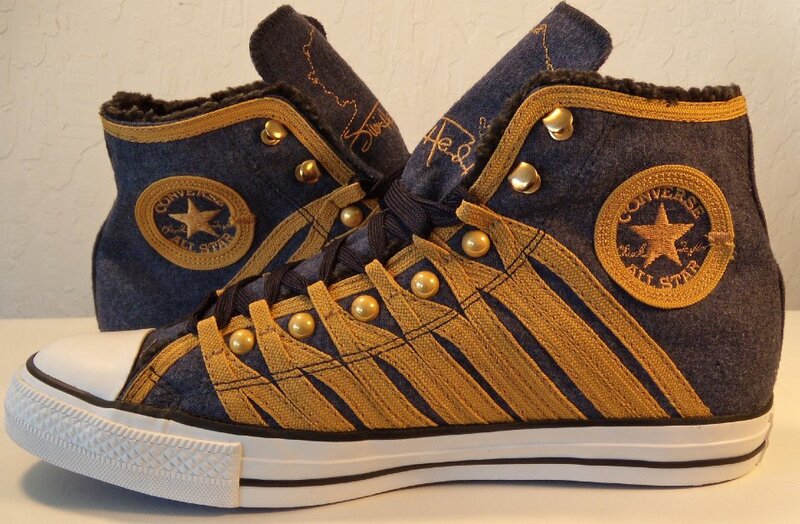 10 Jimi Hendrix High Top Chucks Angled front view of Jimi Hendirx Jacket high tops. 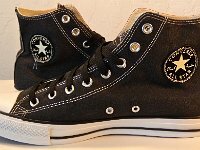 11 Jimi Hendrix High Top Chucks Inside patch views of Jimi Hendirx Jacket high tops. 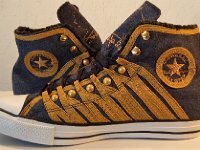 12 Jimi Hendrix High Top Chucks Outside views of Jimi Hendirx Jacket high tops. 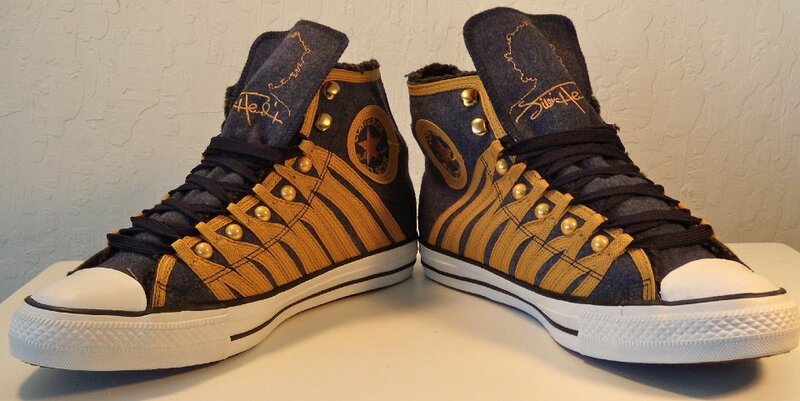 13 Jimi Hendrix High Top Chucks Inside patch and sole views of Jimi Hendirx Jacket high tops. 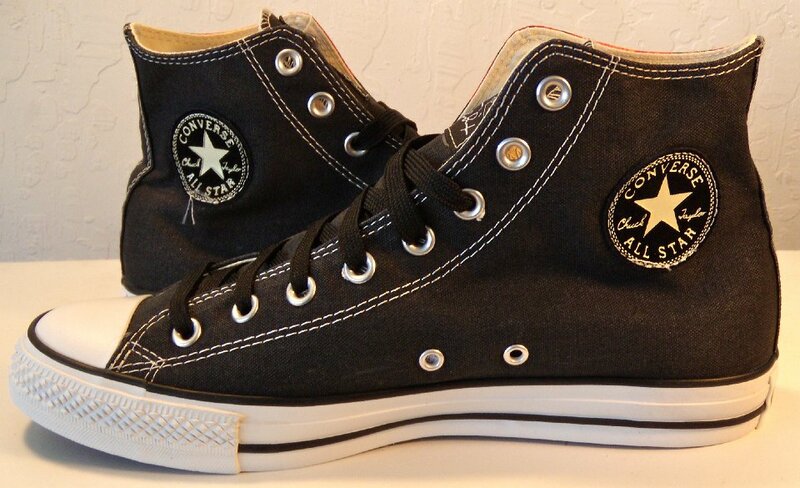 14 Jimi Hendrix High Top Chucks Inside patch view of a right Jimi Hendirx album cover print high top. 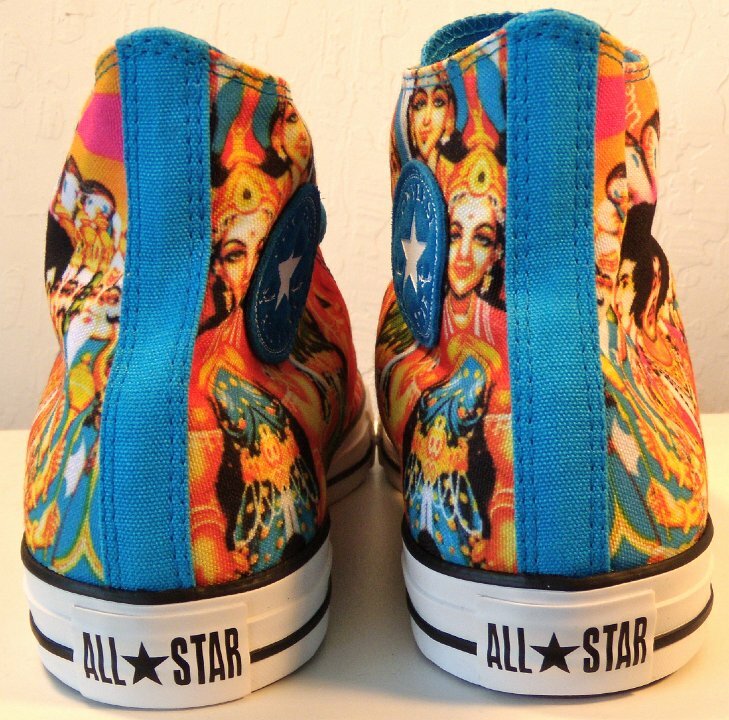 15 Jimi Hendrix High Top Chucks Inside patch view of a left Jimi Hendirx album cover print high top. 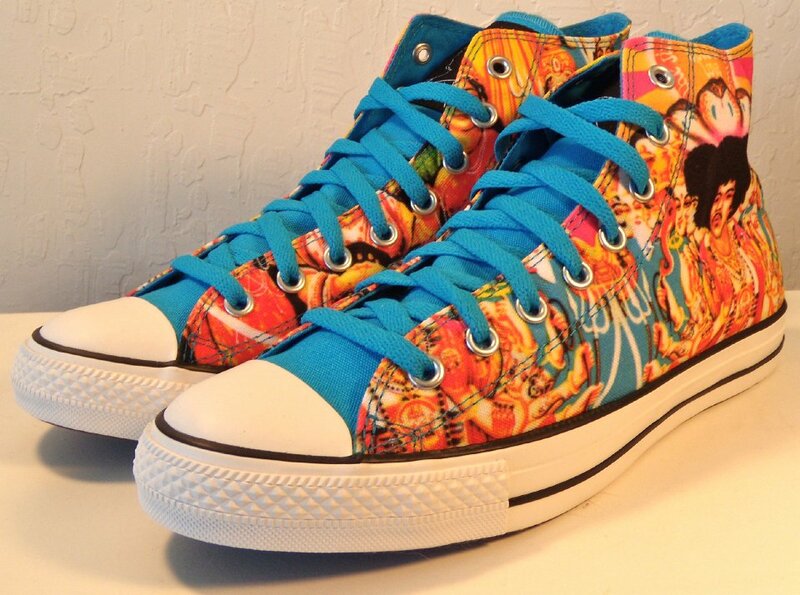 16 Jimi Hendrix High Top Chucks Outside view of a right Jimi Hendirx album cover print high top. 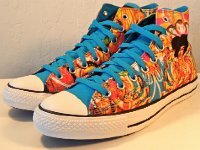 17 Jimi Hendrix High Top Chucks Outside view of a left Jimi Hendirx album cover print high top. 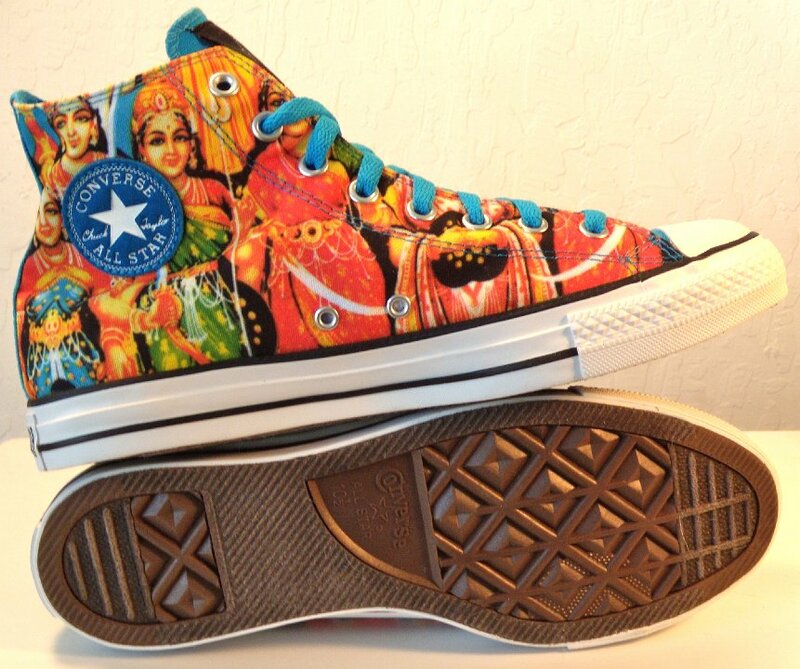 18 Jimi Hendrix High Top Chucks Rear view of Jimi Hendirx album cover print high tops. 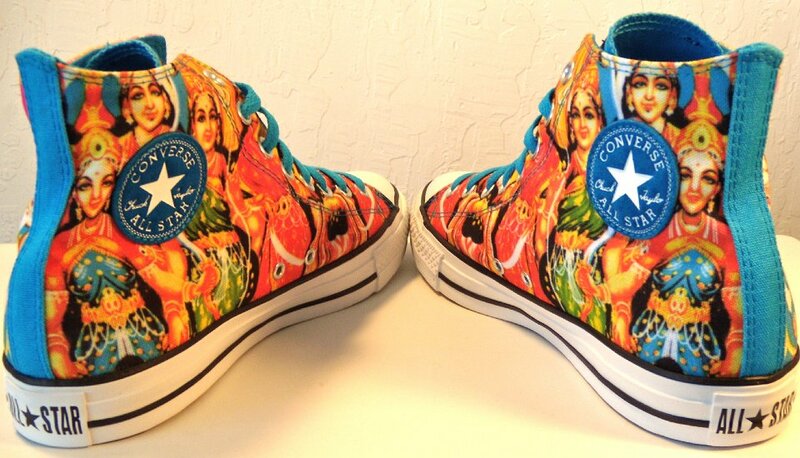 19 Jimi Hendrix High Top Chucks Angled rear view of Jimi Hendirx album cover print high tops. 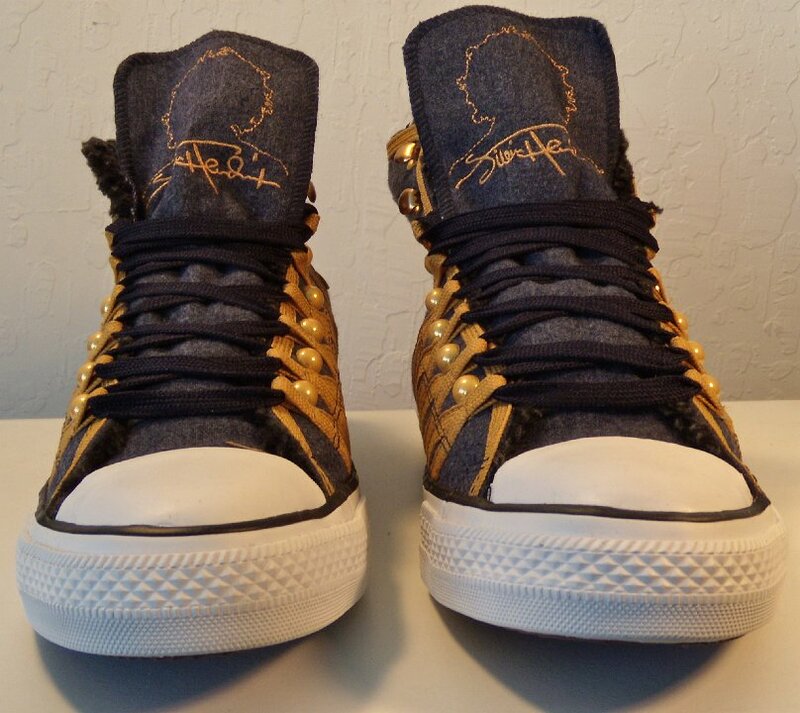 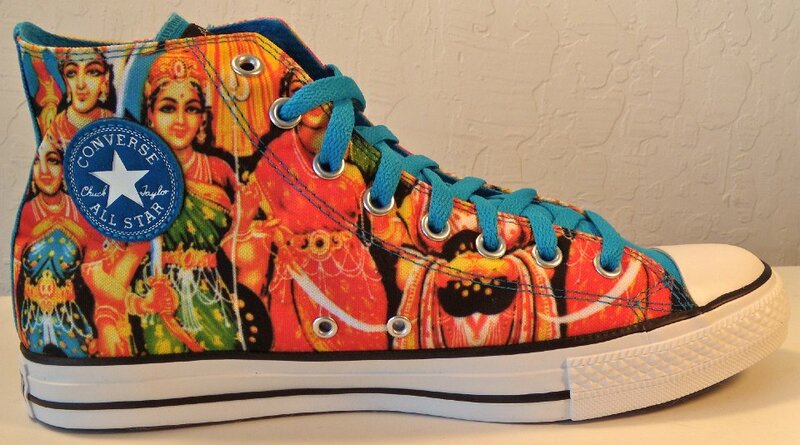 20 Jimi Hendrix High Top Chucks Angled side view of Jimi Hendirx album cover print high tops. 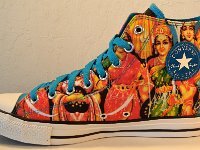 21 Jimi Hendrix High Top Chucks Front view of Jimi Hendirx album cover print high tops. 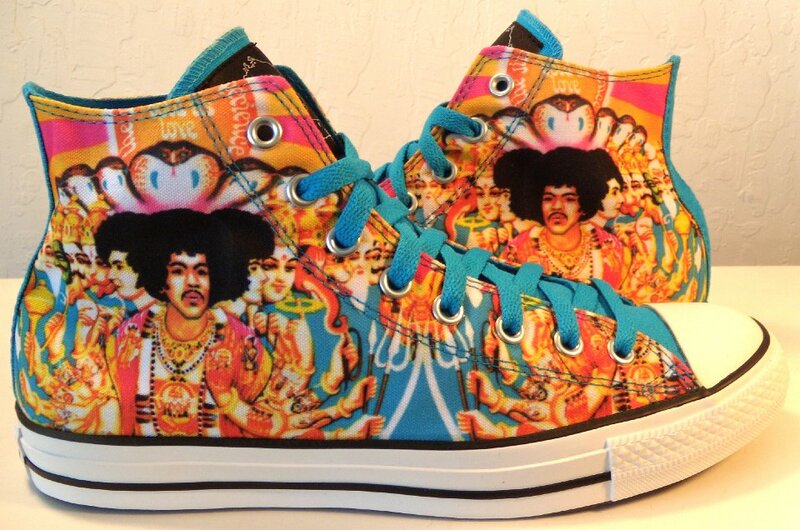 22 Jimi Hendrix High Top Chucks Angled front view of Jimi Hendirx album cover print high tops. 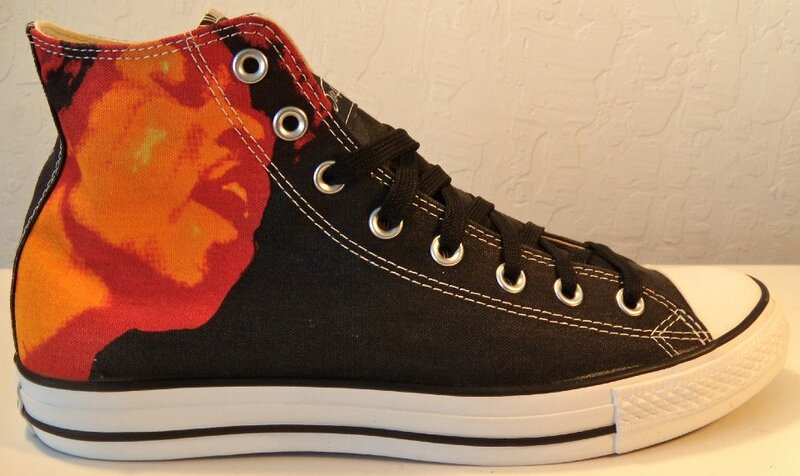 23 Jimi Hendrix High Top Chucks Closeup view of the embroidered tongue on a Jimi Hendirx album cover print high top. 24 Jimi Hendrix High Top Chucks Top view of Jimi Hendirx Jacket high tops. 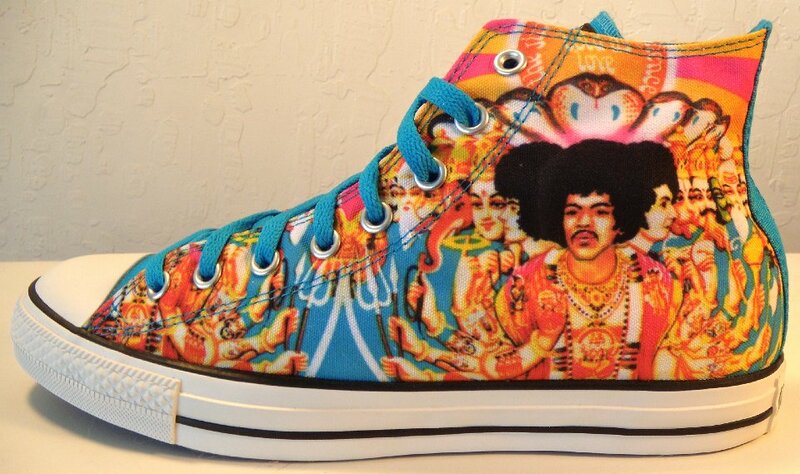 25 Jimi Hendrix High Top Chucks Top view of Jimi Hendirx album cover print high tops. 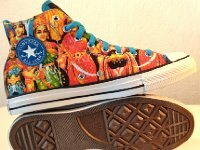 26 Jimi Hendrix High Top Chucks Inside patch views of Jimi Hendirx album cover print high tops. 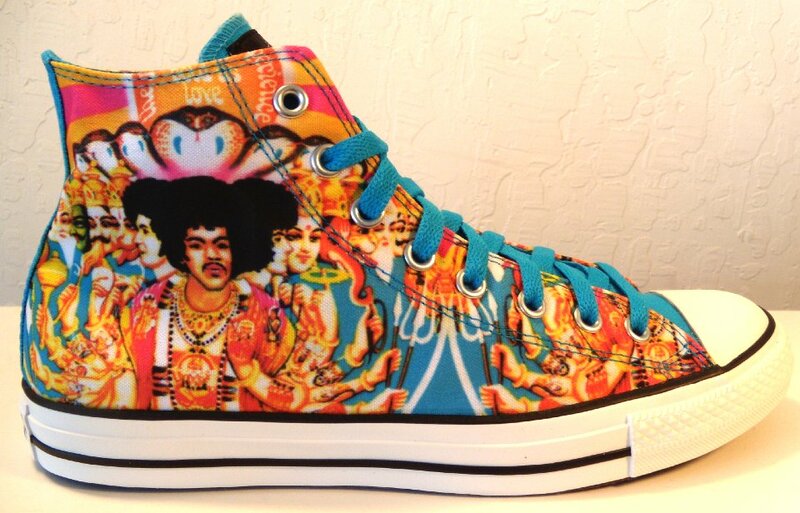 27 Jimi Hendrix High Top Chucks Outside views of Jimi Hendirx album cover print high tops. 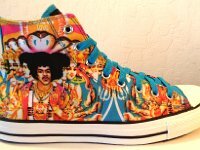 28 Jimi Hendrix High Top Chucks Inaside patch and sole views of Jimi Hendirx album cover print high tops. 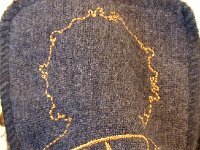 29 Jimi Hendrix High Top Chucks Inside patch view of a right Jimi Hendirx face print high top. 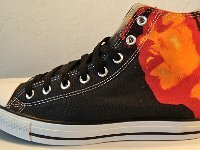 30 Jimi Hendrix High Top Chucks Outside view of a right Jimi Hendirx face print high top. 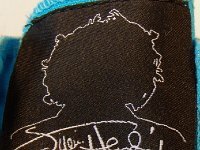 31 Jimi Hendrix High Top Chucks Inside patch view of a left Jimi Hendirx face print high top. 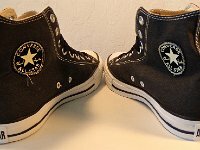 32 Jimi Hendrix High Top Chucks Outside view of a left Jimi Hendirx face print high top. 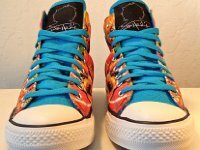 33 Jimi Hendrix High Top Chucks Rear view of Jimi Hendirx face print high tops. 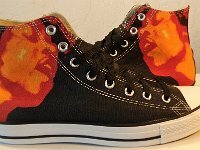 34 Jimi Hendrix High Top Chucks Angled rear view of Jimi Hendirx face print high tops. 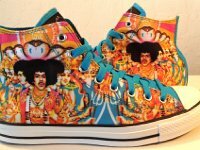 35 Jimi Hendrix High Top Chucks Angled side view of Jimi Hendirx face print high tops. 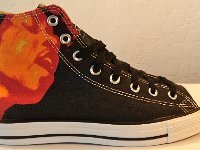 36 Jimi Hendrix High Top Chucks Front view of Jimi Hendirx face print high tops. 37 Jimi Hendrix High Top Chucks Closeup view of the embroidered tongue on a Jimi Hendirx face print high top. 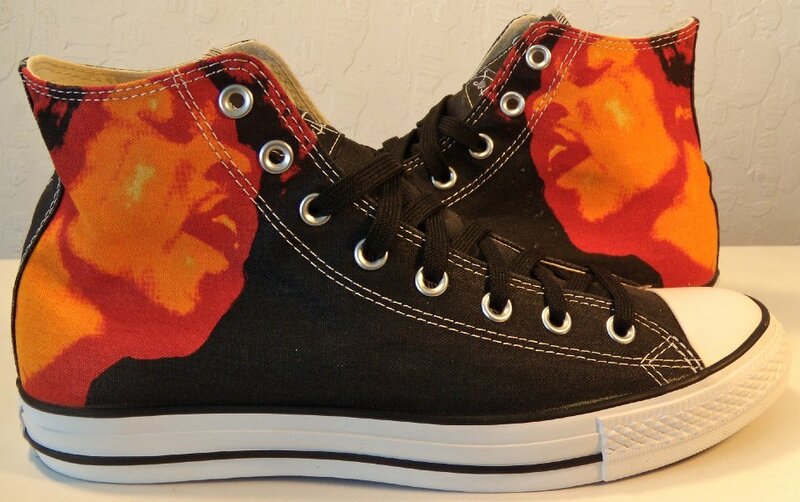 38 Jimi Hendrix High Top Chucks Angled front view of Jimi Hendirx face print high tops. 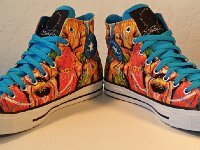 39 Jimi Hendrix High Top Chucks Top view of Jimi Hendirx face print high tops. 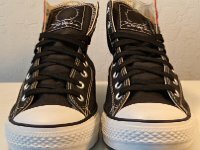 40 Jimi Hendrix High Top Chucks Inside patch views of Jimi Hendirx face print high tops. 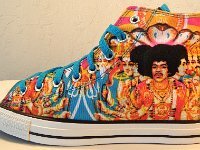 41 Jimi Hendrix High Top Chucks Outside views of Jimi Hendirx face print high tops. 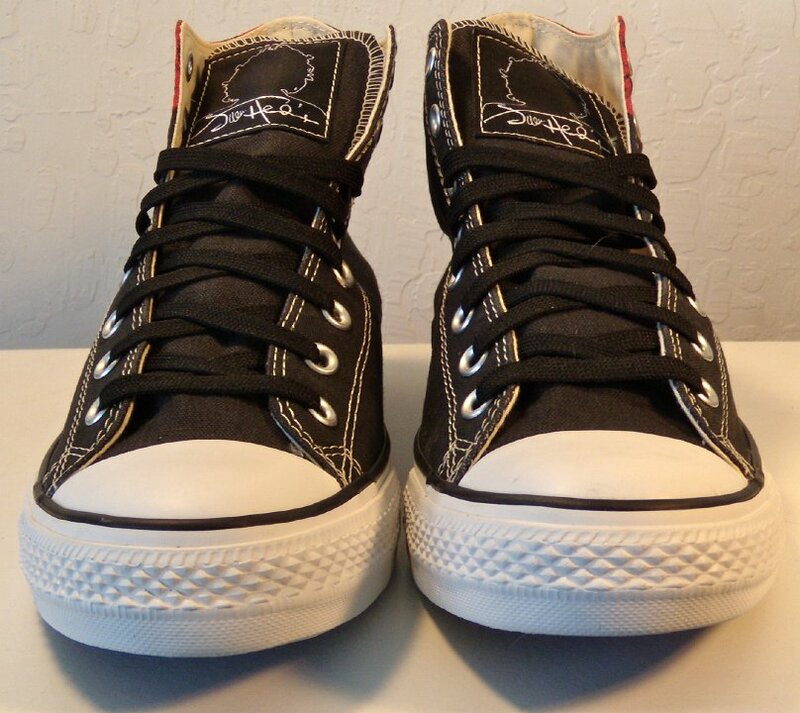 42 Jimi Hendrix High Top Chucks Inside patch and sole views of Jimi Hendirx face print high tops. 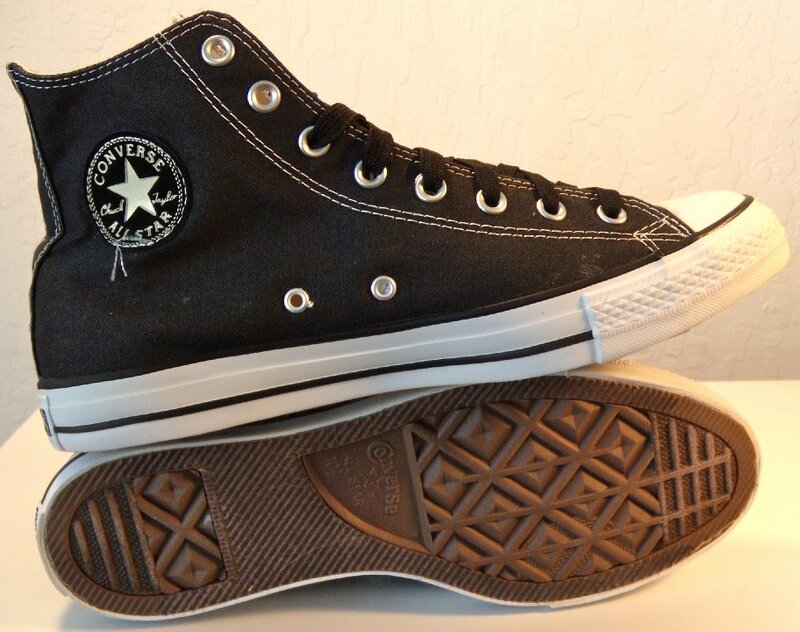 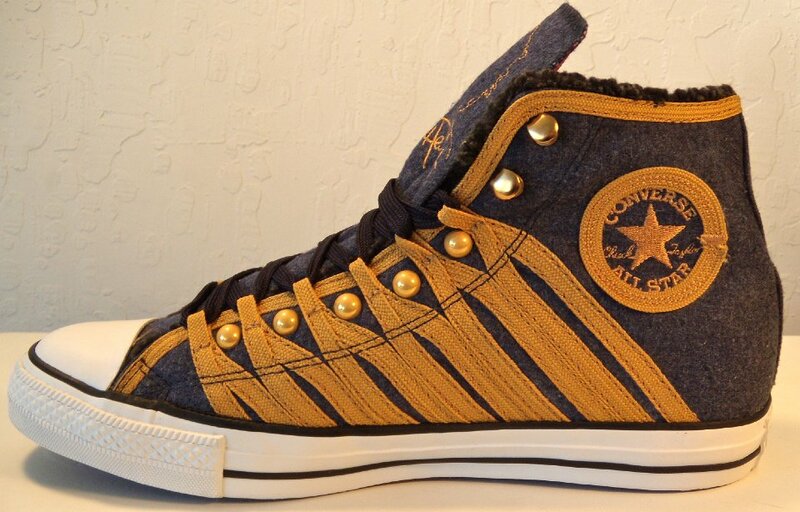 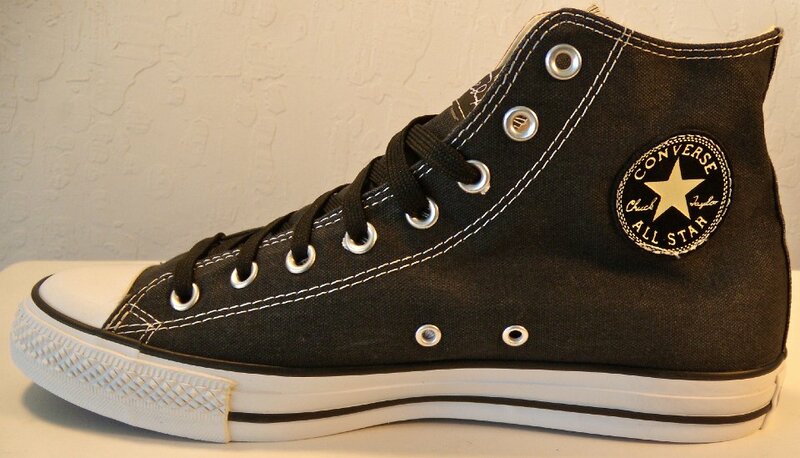 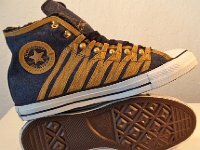 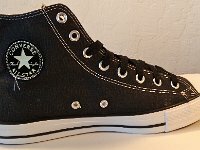 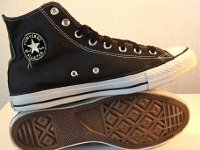 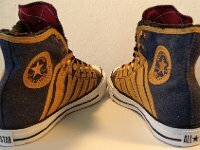 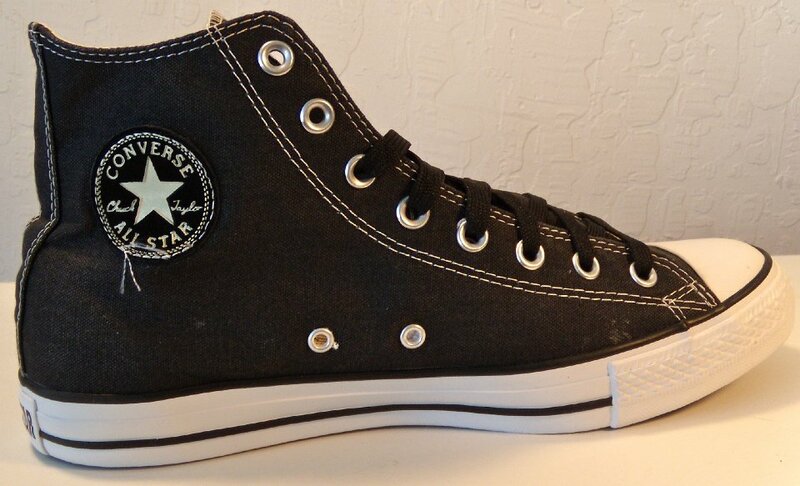 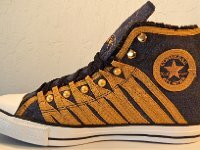 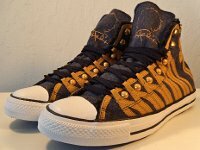 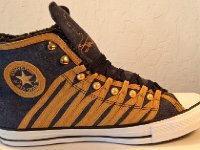 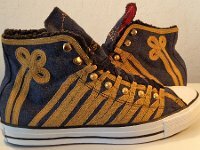 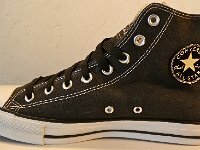 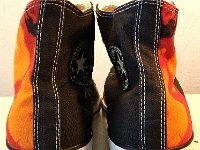 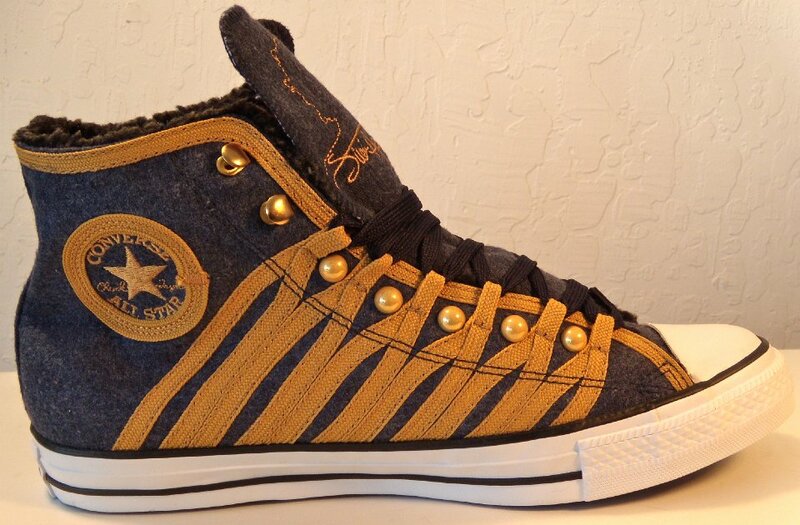 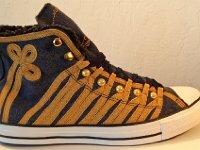 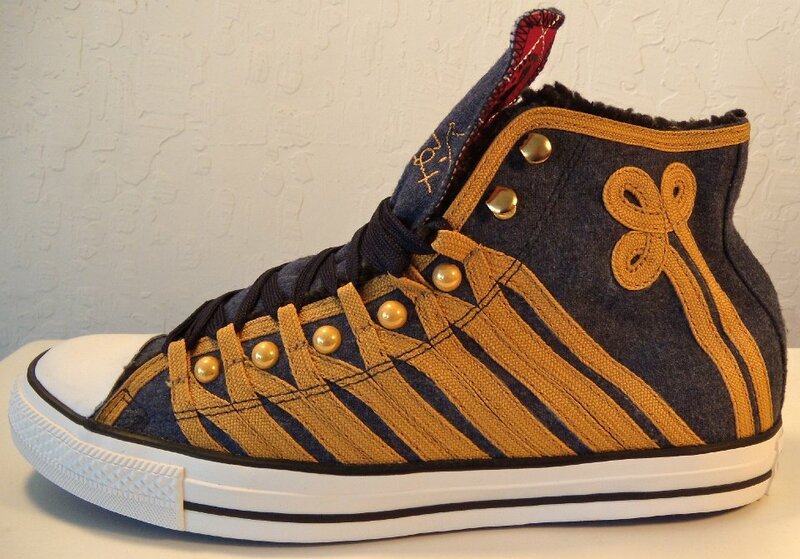 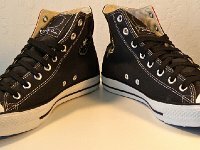 Converse issued this 2010 line of high tops in tribute to Jimi Hendrix as part of their famous musician series of chucks. 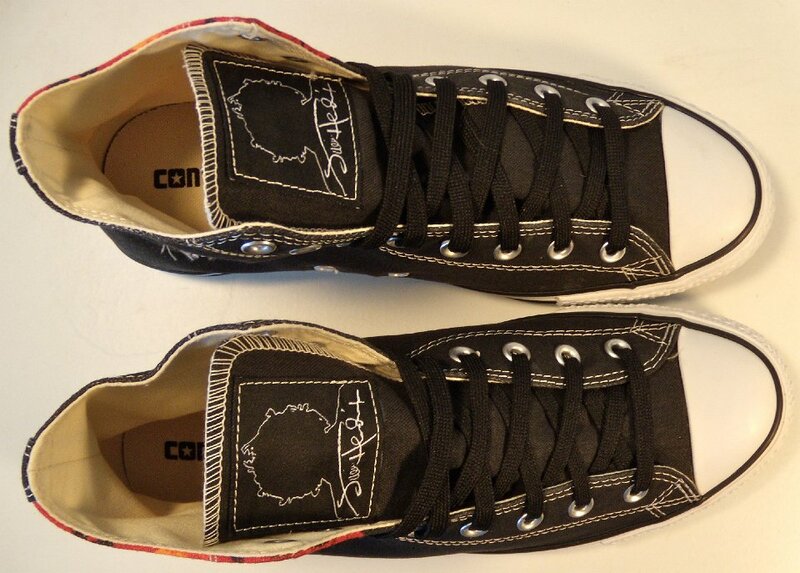 The shoes come with a special tag . 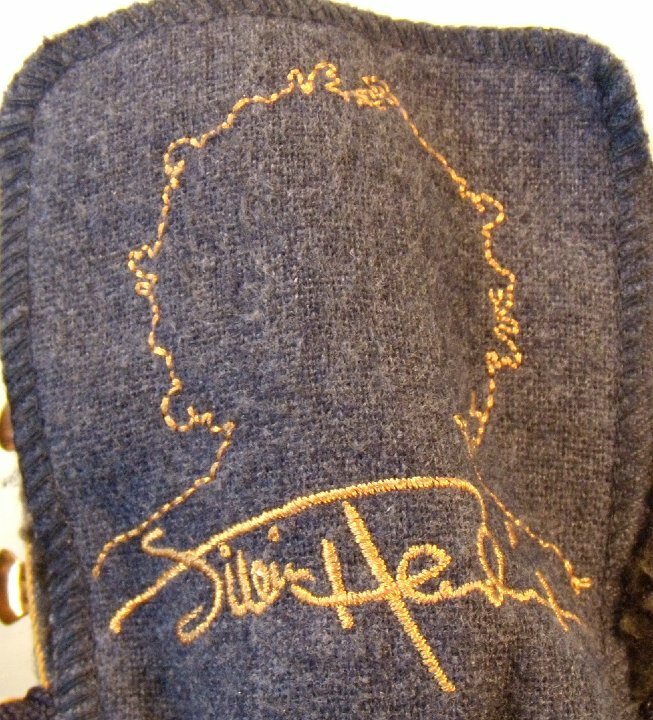 On the front of the tag it says "Authentic Hendrix". 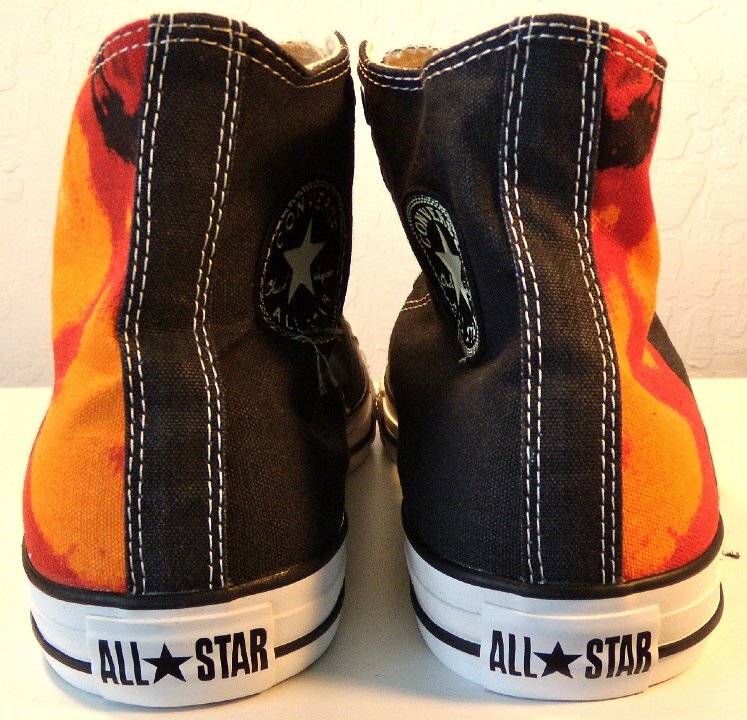 On the rear of the tag it says "Inspired by Psychedelic Distortions of Sound." 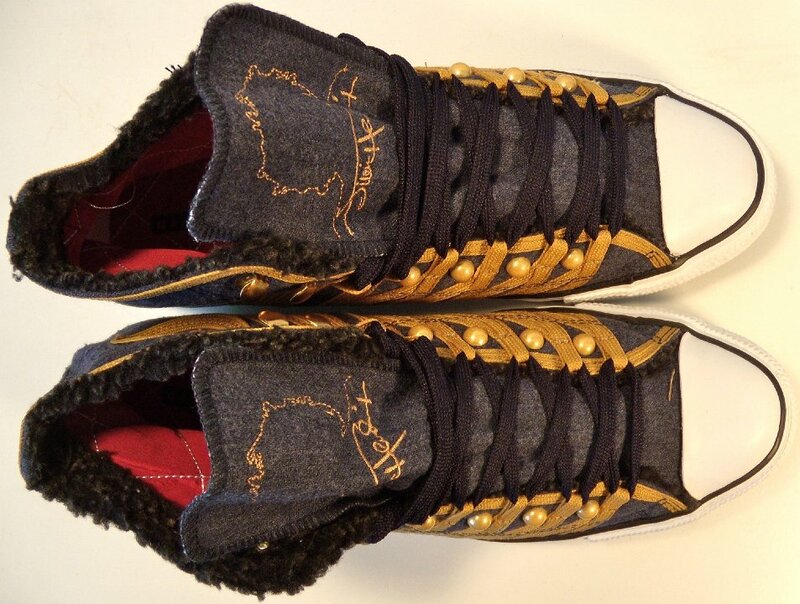 The outer trim of the Jimi Hendrix Jacket high tops are completely made of woven strips of cloth. 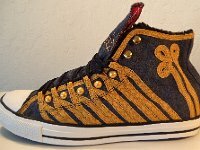 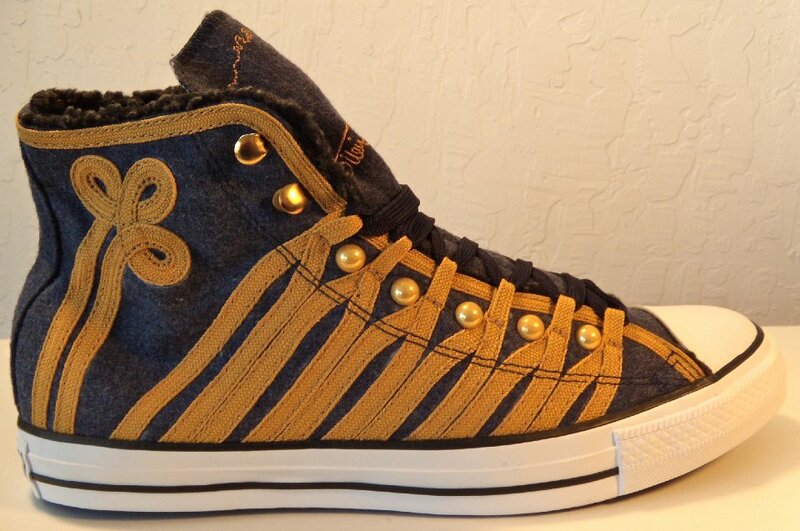 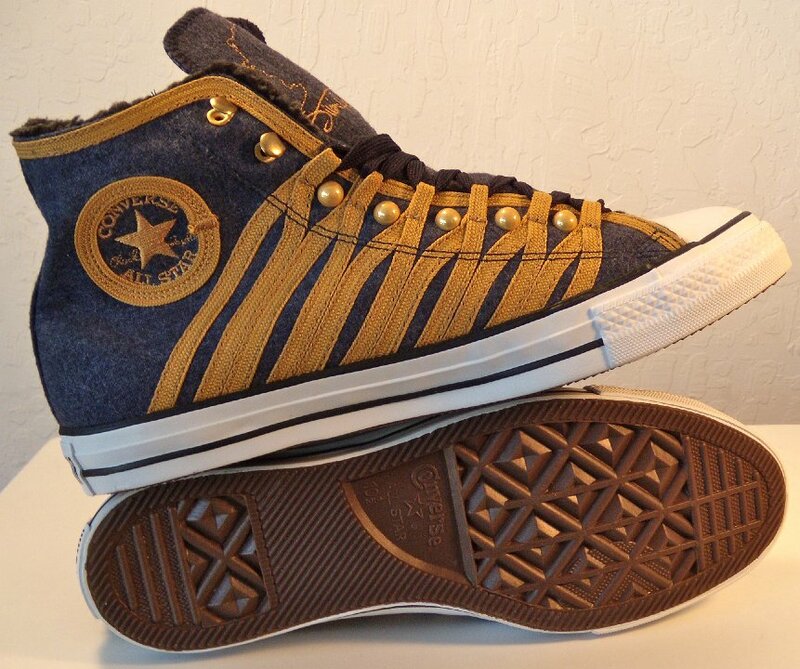 Instead of the normal eyelets the laces are held by cloth loops or metal studs and even the ankle patch is embroidered and surround by a gold strip of cloth. 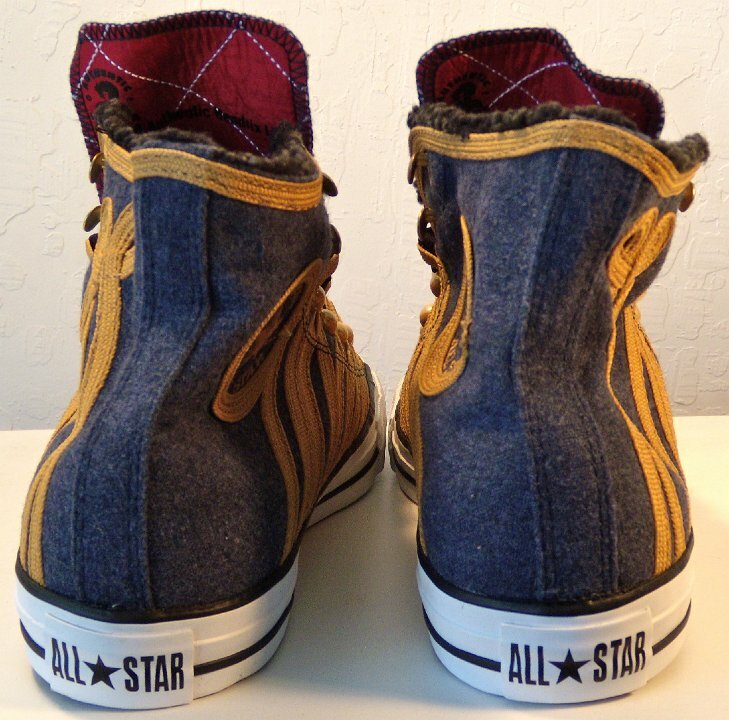 The uppers are made of velour and the inside shoe lining is a red print. 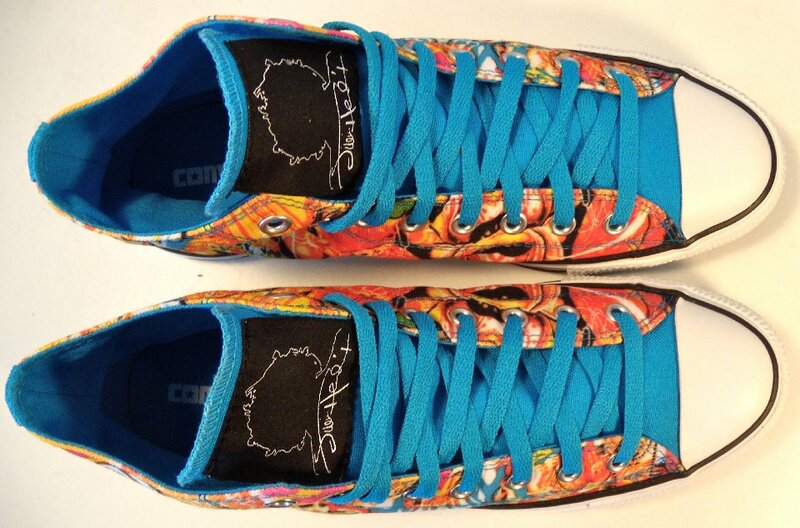 The album cover print shoe is a normal print with sky blue lining and laces. 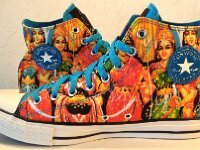 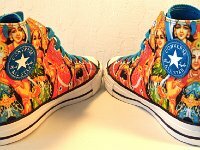 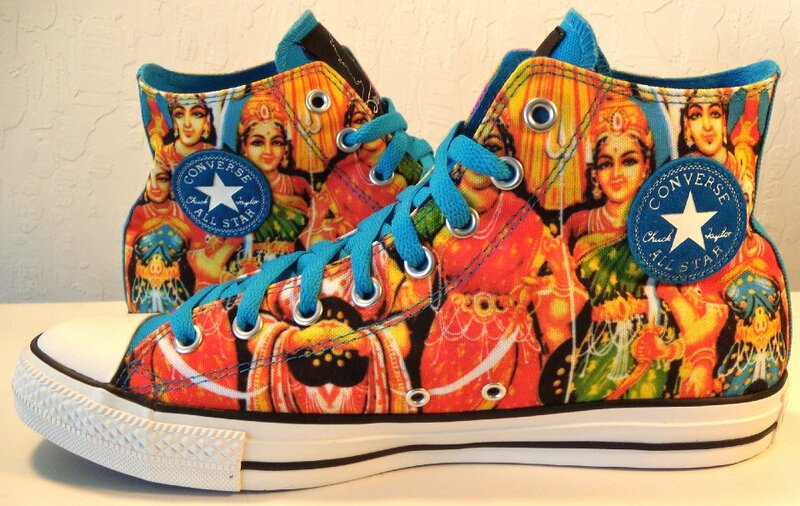 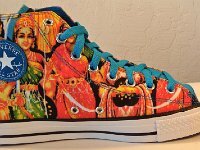 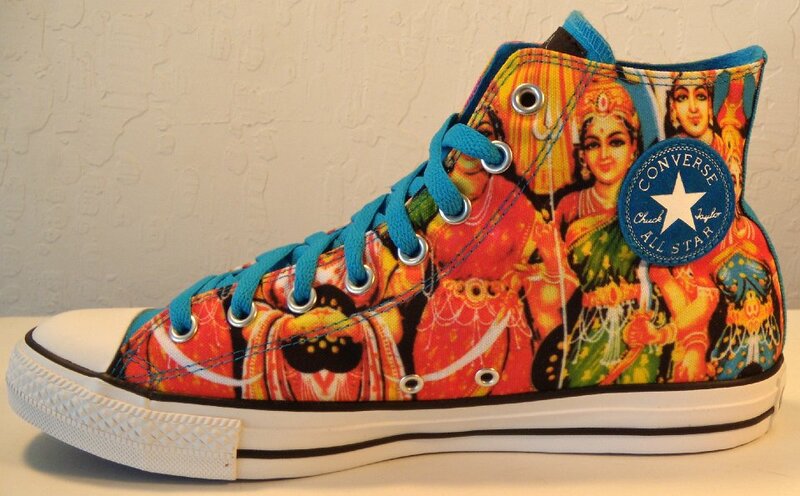 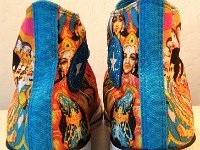 This shoe was recalled by Converse about a month after its issue by people in the Hindu community who didn't mind pictures of their deities on a record album cover but objected to them on a shoe. 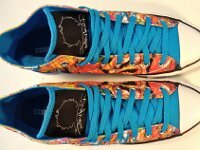 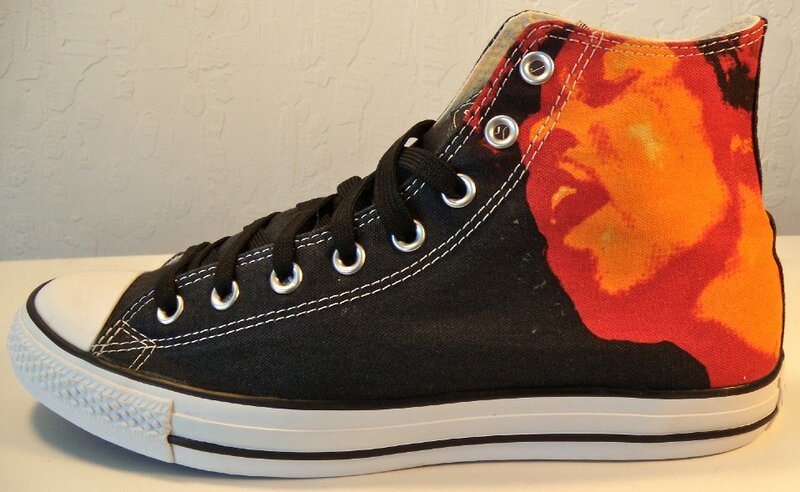 The third shoe in the series is a colored print of Jimi's face on a black high top with black laces. 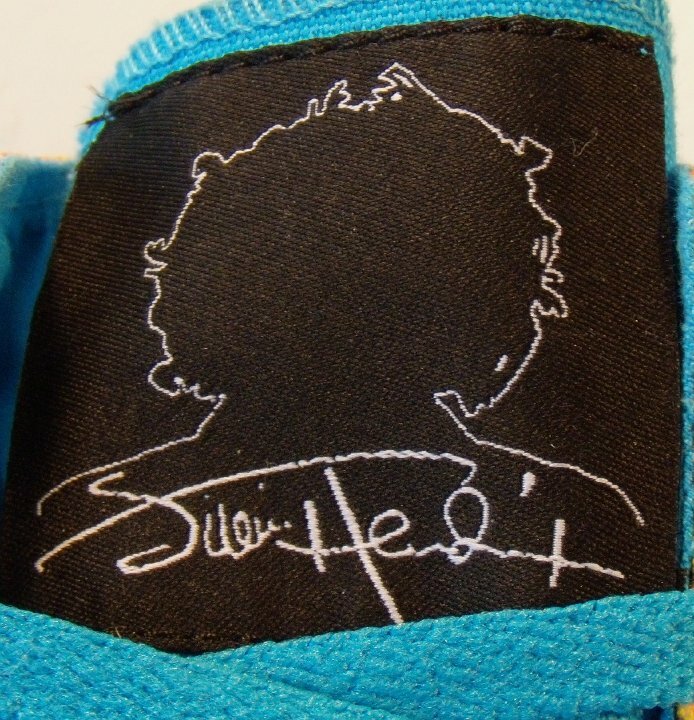 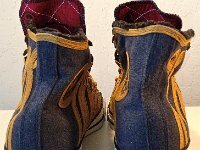 The tongues of each model of shoe have an embroidered outline of Jimi Hendrix along with his signature.